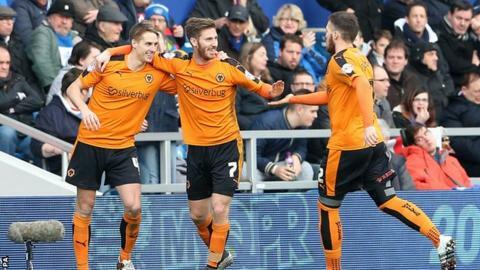 James Henry's deflected effort gave Wolves a deserved point against QPR at Loftus Road in the Championship. German striker Sebastian Polter put Rangers ahead after two minutes by heading in Matt Phillips' free-kick. Henry then levelled just after the break with a strike that deflected off two home defenders before squeezing past home goalkeeper Alex Smithies. Tjaronn Chery should have scored a late home winner, but smashed against the post from Conor Washington's cross. The result suits neither side, leaving Jimmy Floyd Hasselbaink's QPR with only one win in their last nine league matches and Wolves eight points adrift of the play-off positions. Wolves, already without injured attacking duo Michal Zyro and Jordan Graham, were dealt a further late blow when Dave Edwards limped off, before leaving the stadium on crutches. QPR had looked dominant in the first half, with Polter causing Wolves centre-backs Danny Batth and Ethan-Ebanks Landell all sorts of problems. But Wolves brought themselves level after good work from the impressive Rajiv van La Parra set up Henry, whose shot hit both Grant Hall and Nedum Onuoha on its way into the net. Then midway through the second period, Smithies pulled off a succession of great saves to deny left-back Matt Doherty's fierce strike and further efforts by Conor Coady and Edwards from the resulting corner. QPR could have won it late on, but after great work down the left from substitute Washington with his first touches since his move from Peterborough, Chery should have hit the target from eight yards out but it bounced off the post. "In the first half we needed to score again and make it 2-0. They were on top in the second half, but in the first half we caused them a lot of trouble. "We also had a really good chance in the last minute to score and make it 2-1. I would have backed Chery every day of the week to score. Nine times out of 10 he would score that, but this time he didn't. "The important thing for us is that we keep working hard and keep doing things right. I'm very happy with the performance of my players and the way we slotted together, especially in the first half." "We need a hell of a run to get there, but it is still open. The top sides don't look like dropping points at the moment, but that can change. "We don't need much in terms of players. We don't need to reconstruct a spirited squad. With the right additions we feel we can climb the table. We don't feel we're too far away. There is a gap, but we're trying to close it. "Dave Edwards has a problem with the top of his foot/ankle. It does not look good at the moment but it's hard to make an assessment." Match ends, Queens Park Rangers 1, Wolverhampton Wanderers 1. Second Half ends, Queens Park Rangers 1, Wolverhampton Wanderers 1. Attempt missed. Kevin McDonald (Wolverhampton Wanderers) right footed shot from the left side of the box misses to the left. Attempt blocked. James Henry (Wolverhampton Wanderers) right footed shot from outside the box is blocked. Assisted by Rajiv van La Parra. Attempt missed. Tjaronn Chery (Queens Park Rangers) left footed shot from outside the box misses to the right. Assisted by Sebastian Polter. Paul Konchesky (Queens Park Rangers) wins a free kick in the defensive half. Tjaronn Chery (Queens Park Rangers) hits the left post with a left footed shot from the centre of the box. Assisted by Conor Washington with a cross. Attempt missed. Leroy Fer (Queens Park Rangers) header from the right side of the six yard box is close, but misses to the right. Assisted by Matthew Phillips with a cross following a corner. Corner, Queens Park Rangers. Conceded by Dominic Iorfa. Offside, Wolverhampton Wanderers. Matt Doherty tries a through ball, but Adam Le Fondre is caught offside. Substitution, Queens Park Rangers. Conor Washington replaces Junior Hoilett. Substitution, Wolverhampton Wanderers. George Saville replaces Dave Edwards because of an injury. Attempt missed. Junior Hoilett (Queens Park Rangers) right footed shot from outside the box is high and wide to the right. Assisted by Matthew Phillips. Dave Edwards (Wolverhampton Wanderers) wins a free kick in the attacking half. Attempt saved. Dave Edwards (Wolverhampton Wanderers) header from the centre of the box is saved in the centre of the goal. Assisted by Kevin McDonald. Attempt saved. Conor Coady (Wolverhampton Wanderers) right footed shot from outside the box is saved in the centre of the goal. Assisted by Rajiv van La Parra with a cross. Corner, Wolverhampton Wanderers. Conceded by Alex Smithies. Attempt saved. Matt Doherty (Wolverhampton Wanderers) right footed shot from the left side of the box is saved in the top centre of the goal. Assisted by Dave Edwards. Attempt blocked. Matthew Phillips (Queens Park Rangers) right footed shot from the centre of the box is blocked. Assisted by Sebastian Polter. James Henry (Wolverhampton Wanderers) wins a free kick on the left wing. Attempt missed. Danny Batth (Wolverhampton Wanderers) header from the centre of the box misses to the right. Assisted by Kevin McDonald following a set piece situation.